Munich - FC Augsburg extended Borussia Mönchengladbach's winless run to nine matches with victory at Borussia Park, while relegation-threatened quartet Hamburger SV, Eintracht Frankfurt, VfB Stuttgart and Eintracht Braunschweig were all forced to settle for a share of the spoils. 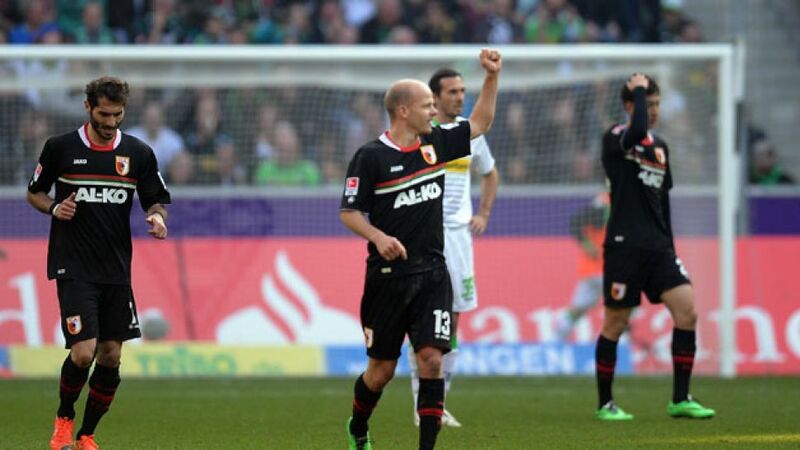 Augsburg climbed above Borussia Mönchengladbach and into sixth in the Bundesliga courtesy of a deserved 2-1 win at Borussia Park. Gladbach, who had failed to win any of their six Bundesliga matches in 2014 prior to Matchday 24, took the lead inside five minutes when Augsburg lost possession cheaply in the centre of the park, allowing Raffael to pick up the loose ball and fire an unstoppable shot in off the post for his twelfth goal of the season. Augsburg managed to go into half-time on level terms, however, thanks to Halil Altintop’s close-range bicycle kick ten minutes before the interval. Markus Weinzierl’s charges almost went in front three minutes after the restart, but Jan Moravek’s long-range effort whistled just wide of Marc-Andre ter Stegen’s left-hand post. The Fuggerstädter were proving a threat on the counter-attack, but after Tobias Werner had seen his shot fly over the bar, Martin Stranzl went within a whisker of putting the Foals back in front when he headed against the crossbar from deep inside the box. Augsburg, who had not lost away from home since their 3-0 defeat to FC Bayern München in November, took the lead nine minutes from time, courtesy of another clinical counter-attack. Andre Hahn’s pinpoint pass was collected by Werner, who calmly slotted past ter Stegen to seal the Bavarians' third consecutive away win. A Hakan Calhanoglu penalty rescued a point for Hamburger SV against Eintracht Frankfurt in a hard-fought encounter at the Imtech Arena. Mirko Slomka’s injury-hit HSV started brightly and Eagles’ keeper Kevin Trapp had to be on his toes early on to deny Ivo Ilicevic, who had let fly from the edge of the penalty area. Hamburg continued to put the visitors under pressure, but it was Frankfurt who took the lead after 27 minutes when Alexander Madlung, who had stayed up following a corner, hit a venomous volley past Rene Adler for the defender’s first of the campaign. Calhanoglu almost equalised with one of his trademark free-kicks on the hour-mark, but his cross-shot flew just wide of the post, with the onrushing HSV attack unable to get a touch. The Turkish youngster was the presented with a golden opportunity to level the scores ten minutes later, when Frankfurt defender Carlos Zambrano brought down Jacques Zoua inside the box. He made no mistake from the resulting penalty, firing high into the roof of the net for his second goal in three matches. Trapp did well to save a dipping Calhanoglu effort moments after the 20-year-old’s equaliser, but scoring opportunities proved hard to come by in the final quarter of an hour and both teams were ultimately forced to settle for a point. The result keeps Hamburg in 16th place, while Armin Veh’s team remain in twelfth. Ermin Bicakcic’s late goal earned Bundesliga basement-dwellers Eintracht Braunschweig a point at VfB Stuttgart, who are now without a win in nine league encounters. Torsten Lieberknecht’s side had gone into the game three points adrift at the foot of the table, but went in front after 24 minutes when Antonio Rüdiger’s rushed clearance fell straight to Jan Hochscheidt, who curled the ball into the far corner for his second goal of the season. Braunschweig’s lead didn’t last long, though, with Alexandru Maxim tapping home from close range six minutes later to put Stuttgart back on level terms, before Martin Harnik’s fierce low shot from the edge of the box put the Swabians ahead. Stuttgart could have gone further in front six minutes after half-time when Daniel Davari bundled over Martin Harnik deep inside the Braunschweig penalty area. Davari made amends for his error, though, diving low to his right to save Christian Gentner’s spot-kick. Hochscheidt was then forced to clear Gentner’s inswinging corner off the line as Stuttgart pushed for a decisive third goal. Eight minutes from time, however, Hochscheidt’s corner was scrambled home by former Stuttgart defender Bicakcic, the 24-year-old Bosnian’s first goal of the season. The 2-2 result does little to help either side's relegation woes, but Stuttgart will be relieved to have avoided a ninth consecutive Bundesliga defeat at the Mercedes-Benz Arena on Saturday.